Quick and easy way to drill small holes. "Must have" tool in the field box for emergency repairs. 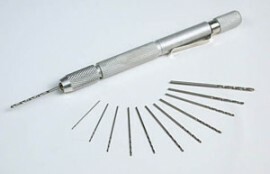 sizes range from 0.6 mm (.024") to 1.6 mm (.063"). Length: 10.5 cm (4- 1/8").